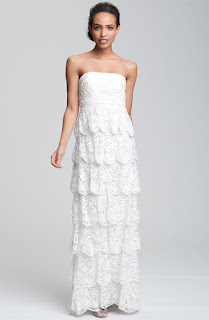 I love this Sue Wong gown from Nordstrom! It’s $558 (seriously!) The tiers make a super romantic pick for a spring Garden wedding; I’m thinking Nasher Sculpture Center, hair in loose curls with a birdcage veil, long pearl necklace and blush pink heels.